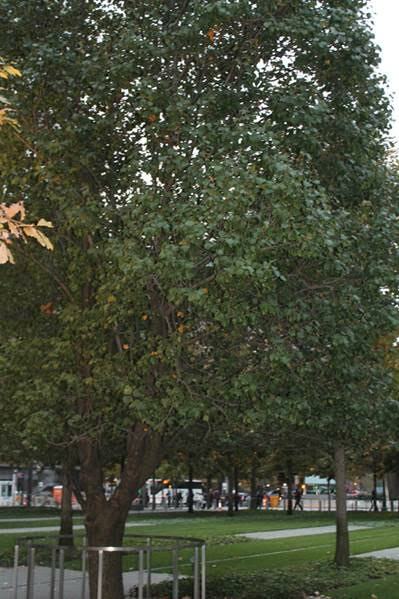 The Survivor Tree lived on the site of the original World Trade Center. After the attacks on September 11, 2001, the burnt and ailing pear tree was removed from its home and nursed back to health. It has since returned and continued to flourish, and has become a symbol for recovery and resiliency. 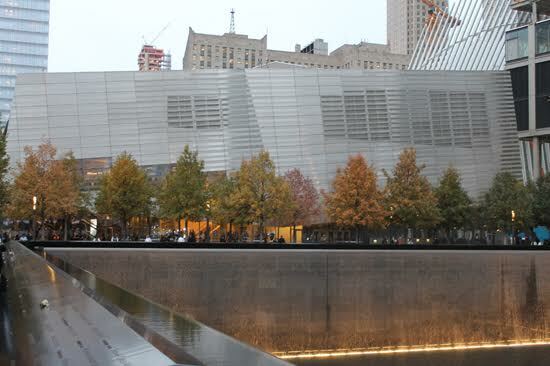 From a spot beside the tree, the glowing National September 11 Memorial Museum Pavilion appears to grow straight out of the ground, itself representing the past and promise of the future. On the 27th Archtober tour, Aaron Dorf from Snøhetta explained that the firm had initially worked on a different project for the site that didn’t go forward, but the team was asked to return and design a welcome center that could address the museum’s security issues. The entrance to the museum presented an entirely new set of security challenges, and Snøhetta was tasked with finding a creative solution. The pavilion’s program expanded to include not only the security-screening lobby, but also a private room for victims’ family members, an auditorium, a café, and myriad back-of-house mechanical services for all of the buildings on the site. 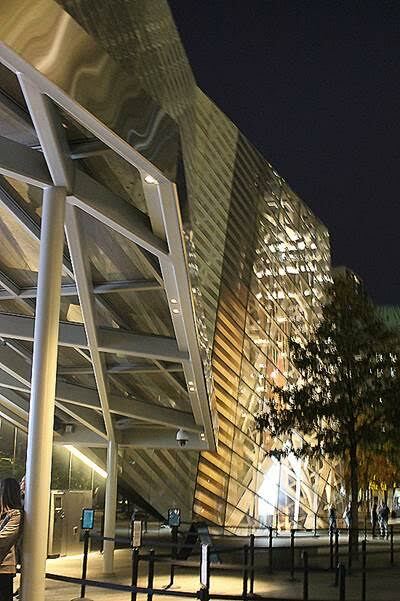 In addition to being a transitional space for visitors between the memorial plaza and the below-ground museum, the building is also a vent, allowing air to move through the slatted wood ceiling and perforated metals. Visible through the transparent facade, original steel columns from the World Trade Center anchor the building. After being removed from the rubble at Ground Zero, these imposing columns were rebuilt and re-engineered. 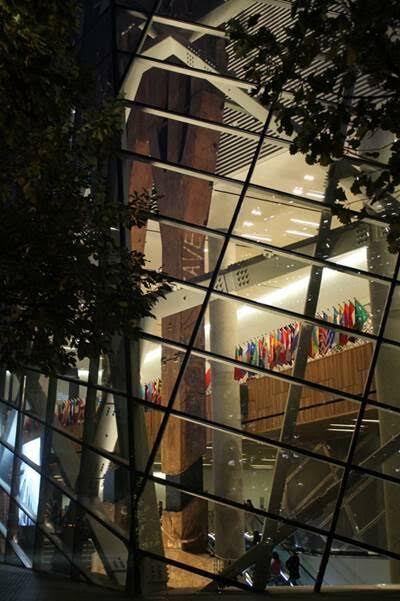 Although they do not serve any structural purpose, the building was designed around them. 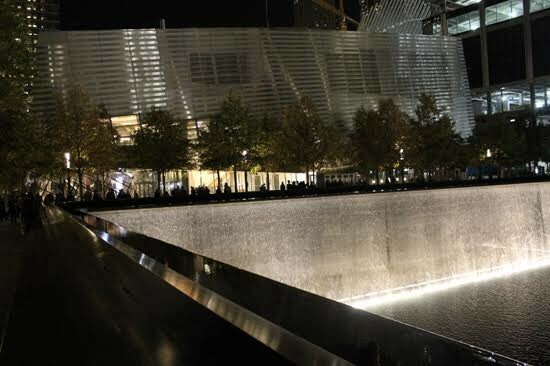 Referred to as “tridents” because they branch out into three prongs that formed the small but distinct windows of the World Trade Center towers, the dark structures, standing amid the building’s muted tones, set the tone. A prefabricated web of steel beams provide the necessary structural support without distracting from the tridents. 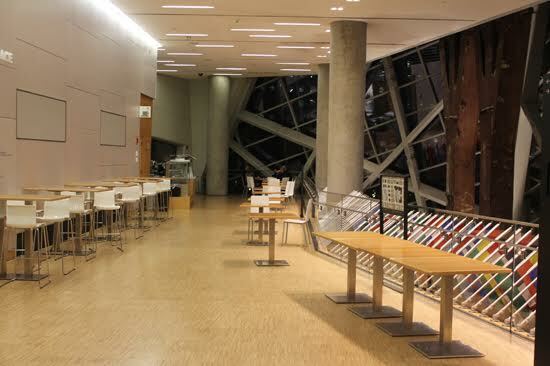 Their asymmetrical pattern, however, adds texture and movement next to the glass walls. From inside, they do not diminish views of the site and the surrounding buildings. The mix of raw and highly refined materials, rough concrete and polished wood side by side, creates an intimate space that gently leads visitors into the museum below, and also helps them readjust when they leave. The relatively small building rises like an urban bridge between the vertical towers around it. It is a bridge between the museum below and everything above, between natural and artificial light – and between the past and the future. Emma Pattiz is the Policy Coordinator at the Center for Architecture and the AIA New York Chapter.